Not strictly Netflix & Chill at all, more BBC iPlayer and Ovaltine. Maybe some crusty bread and some of that cheddar from that “rustic cheeseboard” giftset somebody from work who doesn’t like you very much gave you but the joke’s on them because you love cheese. Ooh, and some piccalilli. 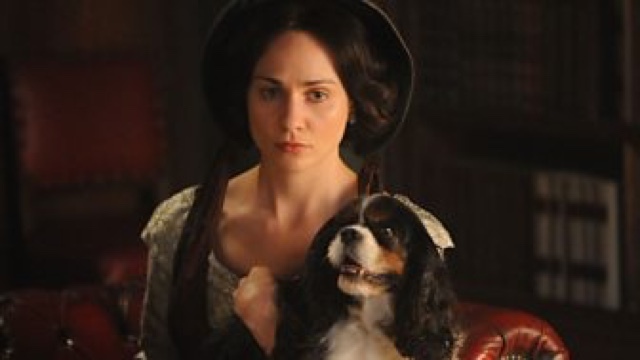 And how I wish I’d watched Dickensian this Christmastime! I just adore Dickens adaptations – my favourite being Little Dorrit (absolutely no musicals here) – there’s nothing more Christmassy than starving Victorians being treated like shite by the wealthy gentry is there? So this 20-parter would have been perfect if I hadn’t been so busy this festive season. Inspired by the works of the great Mr D himself, the opening scenes are chock full of characters you’ll recognise – Messrs Scrooge and Marley, Mrs Gamp, Mr Jaggers the lawyer, the Havisham family, and Fagin. The street scenes are typical Dickensian London: gaslit lamposts, fluffy snow, scruffy urchins. Maybe a bit too typical in fact, but then that’s what audiences want rather than a more authentic recreation of the period. The costumes are excellent and the cast boasts familiar faces such as Tuppence Middleton and Stephen Rea (both starring in this year’s War and Peace), Anton Lesser (Pirates of the Caribbean and Wolf Hall), Caroline Quentin and Pauline Collins. It’s the kind of thing that makes you say “I recognise her” and “what’s he been in?” and reaching for you phone to check IMDb! It was perhaps an ambitious project to pull off – weaving so many fantastic characters from wonderful pieces of classic literature together – but creator and writer Tony Jordan of Red Planet Pictures definitely pulls it off. It’s busy and with lots of characters to keep up with you need to pay close attention at first, but it’s fun. You’ll have to be quick if you want to catch it; episode 1 is only available until Monday night.